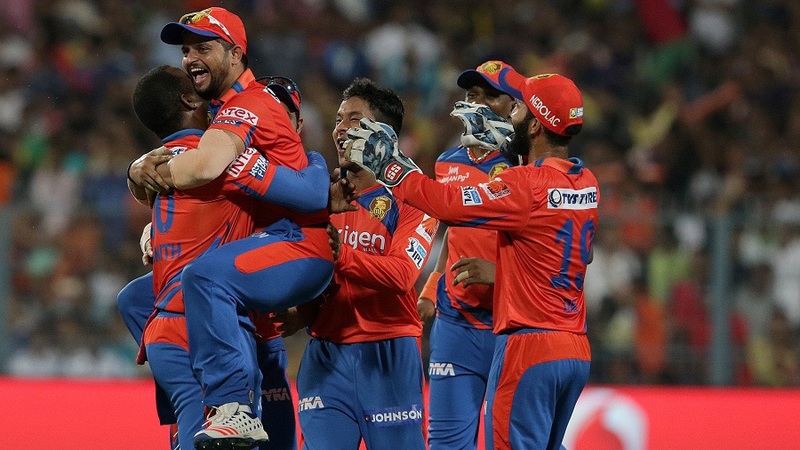 The skill of Gujarat Lions' seam attack, led by Praveen Kumar, beat the depth of Kolkata Knight Riders as they snapped a three-match losing streak and moved to the top of the points table at Eden Gardens on Sunday. Praveen and Dhawal Kulkarni maximised the advantage of bowling under overcast skies by swinging the ball both ways to reduce Knight Riders to 24 for 4 by the end of the Powerplay. Half-centuries from Yusuf Pathan and Shakib Al Hasan, however, lifted the hosts to 158 for 4. Dinesh Karthik's sprightly fifty and a string of cameos then secured Lions' seventh win with five wickets and 12 balls to spare. Praveen laid down the marker in the first over with a big inswinger, which zipped through Gautam Gambhir's gate and nearly shaved the off stump. Suresh Raina strengthened the slip cordon and even added a leg-slip, perhaps teasing Gambhir to glance the ball fine. The Knight Riders captain attempted that shot, only to deflect an inswinger off the thigh to the stumps in Praveen's second over. A ball later, Praveen had Manish Pandey nicking behind for a duck with an outswinger. When Kulkarni dismissed Robin Uthappa in a similar fashion in his second over, Knight Riders lost more than two wickets in the Powerplay for the first time this season.